violence’; especially of persons seeking protection. From a- ‘without’ + syle ‘right of seizure’. So, literally: ‘an inviolable place’. The history of the asylum reads like a fairy tale, a once upon a time of incarceration, forced treatment, demented nurses, torturous contraptions, terror and secrets. A story about what we know now that we didn’t know then. A story of progress. A story of triumph. The market-driven principles of mental health care under neo-liberalism have never been more obvious. 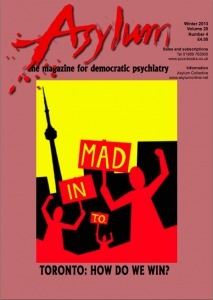 With patients situated as consumers in a mental health system defined by concepts of risk, dominated by Big Pharma, and driven by profit, there is little acknowledgement of rights let alone any substantial resistance to a rapidly expanding mental health system. Worse, many so-called ‘mental health activists’ have become consumed by assimilationist strategies, opting to promote the idea that change can be delivered from within, and advocating peer support and continuing professional education as the new solution to age-old systemic problems: coercion and forced treatment, racism and white supremacy, poverty, homelessness and social isolation … The list goes on. mattered that much – or at all, in truth? It would be laughable if it weren’t so pervasive. And dangerous. There is no institution, big or small, that can protect us from the violence and discrimination that we experience living in this world. No government, no justice system, no asylum. We need to stop looking to them for protection. We do that for each other. We do that for ourselves. We do that in spite of them. In families. In communities. On our own terms. Tell me I am being idealistic, unrealistic. I don’t care. I would rather live my whole life plotting to bring down the asylum than another moment propping it up. And I am not the only one – in Toronto or around the world. Here in these pages, reading these pages. We are tired of losing and angry enough to believe we can win. DID YOU NOTICE WE’RE LOSING?